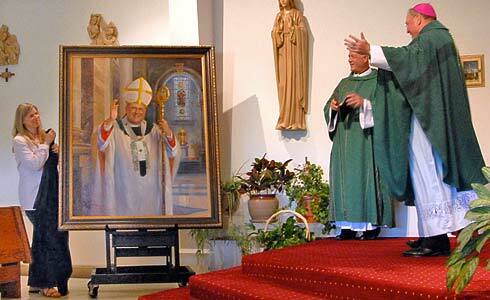 painting will be displayed permanently at the Basilica of Holy Hill in southeast Wisconsin. Hidden River Art Festival in Brookfield Wisconsin. Patrice Hudson has been drawing and painting the figure professionally for nearly thirty years. The passion for painting and drawing came very early in Patrice Hudson’s life. A childhood filled with Saturday morning art lessons at the Milwaukee Art Museum and regular visits to art galleries and museums with her family, helped her develop an early appreciation of fine art that is still her passion today. During her education she was privileged to study in Salzburg, Austria, where she immersed herself in art history, drawing and photography. As she explored the great European museums Patrice became intimately familiar with the works of Leonardo DaVinci, Vermeer and Velasquez. After receiving her Bachelor of Fine Arts degree from the University of Wisconsin system, she was awarded a grant to study at the Ray Vogue School of Design in Chicago. It was from here that her successful two-decade career as a fashion illustrator was launched. child that continues to inspire Patrice, shaping and influencing her work today. 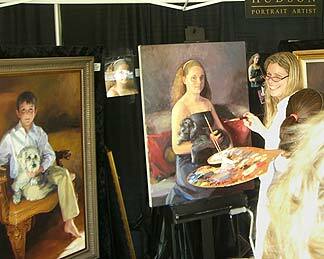 figurative experience that enables her to produce fine art paintings that will be cherished by generations to follow. juried shows locally and nationally. Her highly sought-after work can be found in private homes and institutions across the country. She believes in using her gift of art to give back to her community and continues to raise thousands of dollars annually for worthy causes. She lives with her husband and four children in Fox Point, Wisconsin, where she maintains her studio. at the 47th Annual Milwaukee Art Museum Bal du Lac fundraiser.